FROM PANEL TO PANEL | Plume, A Western Revenge Web Comic with Magic! How ‘bout a Western with a little bit of magic? Plume is exactly that. A modern-looking Western. You can’t have a story about the Wild West without revenge and unexpected partners. 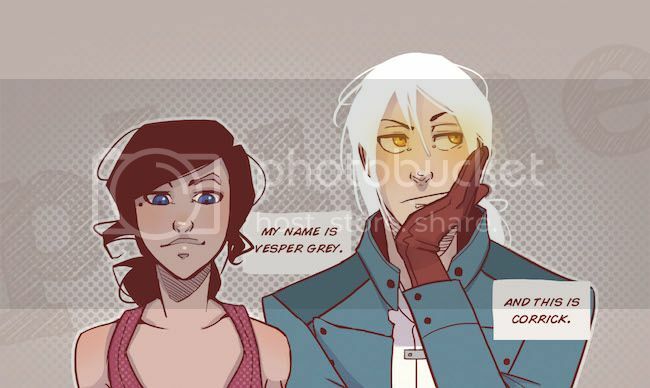 Fabulously named characters: Vesper Grey and Corrick. A heroine, Vesper, who led a fairly boring life, living with her strict aunt, and loves her father (who had been away on his archaeological digs) dearly and awaits for his return. (She and Kate from Vengeance Road would have a lot to talk about—in the father variety.) She can be reckless, but you can’t fault her for acting the way she did because of what happens. A magical necklace that conjures up a magical being who acts as a protector to protect you from danger (a la a genie without the wishes). This being, Corrick, is the best person to be at Vesper’s side. He’ll protect her from enemies out to get her and from herself. Lots of magical artifacts that are full of danger and intrigue and set the terrible events of what happens in motion. I loved seeing what the magical artifacts can do and reading the brief history behind it. An ally who is a Madame of a brothel house and knows how to use her wits and beauty to her advantage, and a scarred baddie who’s after the magical artifacts and becomes the sole focus of Vesper’s revenge. Emotive characters. No words need to be expressed because every annoyed, unimpressed, shocked, and so on looks are beautifully conveyed. Unique retelling of the Western genre. It uses a lot of overdone tropes that’s typical in Westerns. It’s nothing new, aside from the magic inclusion. It makes me want a little reinvention of the genre. It gets boring when all revenge Westerns follow this formula: loved one dies —> hero seeks revenge and rides after the bad guys. Give me something fresh. Emotional connection with the characters. I’m not connecting with the characters as much as I want to. A large part of that is because the characters feel very one-dimensional. Yes, we learn a bit about Vesper, but not enough to be emotional invested in her. We just jump right into it without anything to anchor to anchor us to Vesper. It also doesn’t help the characters feel a bit cliche. I’ve only read the first five chapters of Plume, and I’m liking what I’m reading (even with my problems with it). If you’re looking for a webcomic that’s a quick, but intriguing read with great art, Plume is one you gotta check out. It might not be the most innovative in terms of storytelling, but it’s still a good read. I’m sure the magic will keep you in it. Are you convinced? Add to your TBR on Goodreads. Read from the website. Go buy Plume from your local comic book store or Devil’s Due, or these online retailers: Amazon · Comixology. Or borrow it from your library. Now that you’ve heard about Plume, what do you think? Interested in reading it? I hadn’t heard of this one, but a western with some magic thrown in sounds like something I’d love. I’ll definitely be checking it out! Plume actually sounds really good! I’m a sucker for Western stories lately, plus I really just love the main character’s name ;) Thanks for sharing, Cee! This looks so pretty and I’ve never even heard of it! I will now go devour everything I can get my hands on just for the artwork. I have to say the word western instantly puts me off, but I’m realising I can judge too soon with things so I am willing to overlook that. Also, I’m shallow and art in a comic always trumps the actual story, I can grow to enjoy a story, but if I don’t like the artwork I won’t get beyond the first couple of panels.